notes july issue of a monthly series. both songs are on side a. "kurdt only played on 'bikini twilight', the line-up was: calvin, guitar - kurdt, guitar - tobi, drums. we recorded four songs, including a cover of the Stooges song "Loose". we made about 700 copies of that single. there is a frequently asked questions page that has a lot of info about the history of K and olympia music: here. on the fanzine, 'sand', which I wrote in 1988, there's a review of nirvana's first 45, which as far as I know is the first ever review of a nirvana record, and maybe the first article about the band in general. love, calvin"
notes plain black label, blue silkscreened 'go team' logo (b.1). 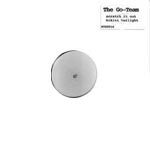 "Originally we wanted all the singles to be one-sided with the blank side to have no label, just a silkscreened image. the pressing plant said they would not press them without a label, so we asked if they would use a blank black label instead. 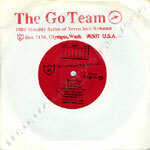 they usually used a blank black label, but often they just used whatever blank labels they had around; so some of the Go Team records have black, green, white or red labels on the b side. also, by the time the summer singles came out, we were pretty burned out on the silk screening, so a lot of them didn't get screened, probably it's more common that they didn't get screened for aug and sept than that they did for july. calvin"